"It's only intertainment folks", sais the master himself in the song Earth Day. Sure it is, but it's kind of hard to review an album like this. Let's start the things like this : Devin Townsend used to be the vocalist and guitar player for Steve Vai, ok and there is some more, he created Strapping Young Lad and Ocean Machine.When he's not under depressive influences this guy is a genius or maybe the opposite when he's under depressive influences he's a genius. I don't know but he's a charismatic lad who brang a lot to Heavy Metal when it was at its wickest in the end of the 90's. 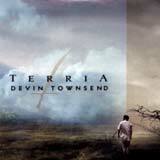 Devin Townsend said that he has made a full circle with his previous releases and explorations into the Heavy Metal horizons. So for him he has left this area for something much more down to earth. So why do I review this album, just because Mr. "Divine" Townsend is great and open minded, very good in what he does and who knows maybe one day he'll find his way back to Mighty Metal. But don't be afraid Terria isn't that far away from Infinity or Ocean Machine Biomech. but it takes quiet some time to get into it. Let's talk a little about the songs. Mountain is a typical Townsend song. Earth Day and Canada are great songs. Deep Peace is about the oceans: deep and blue. Down and Under a folk song. The Fluke is a bit more a Rush soundlike song. Maybe Devin Townsend is the spiritual son from Rush... Nobody's Here and Tiny Tears a depressing ballads with a touch of Pink Floyd. Stagnant is a little more popy sounding like U2's Joshua Tree, it is a very good song. The last one is a heavy blues with nothing interesting on itself. Terria comes out the 27th of august and exists in two versions the regular version and as double cd within digipack as limited edition.